Sambhaji Kadam, deputy superintendent of police, said the trio had been booked under relevant sections of the IPC. Harshvardhan Patil claimed that his supporters found a bottle of ‘chemical dye’ . State cooperatives minister Harshvardhan Patil had to be hospitalised after he received an eye injury as group of protesters from Dhanagar (shepherd) community threw some ink-like substance at his face in village Bhigwan, around 100 km from Pune. Patil later claimed that the substance thrown at him wasn’t ink but ‘some chemical’ that had caused ‘serious injury’ to his left eye. Patil was given primary treatment at a local hospital and was later shifted to a private hospital in Pune. Police had registered a complaint under the sections of Indian Penal Code following which two protesters Sachin Malgunde, (23) Aaba Bandgar (25) both from Madanwadi, Indapur taluka have been arrested, additional superintendent of police (Pune Rural) Ravindrasinh Pardeshi said. Dhangar community leaders have recently launched a statewide agitation for inclusion of the caste in scheduled tribes (ST) category. At present, the community comes under NT (Nomadic Tribes) category. Speaking to the mediapersons later, Patil said the incident took place when he stepped off the podium after a function in Bhigwan and was moving towards his car along with state health minister Suresh Shetty when he was accosted by protesters. “I was walking towards the car with Shetty and my wife when a delegation of doctors came to see us. After they were done, a group of three-four youngsters walked towards us. I thought they wanted to give me some memorandum so I stopped. But when they came close to me, one person took out a bottle from his pocket and thew the substance at me. It went into my eye. Later, I felt a burning sensation in my left eye and saw a doctor. 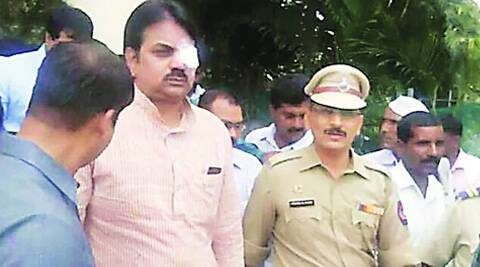 I was sent to Pune for further examination,” said Patil. Patil claimed that his supporters later found a bottle of chemical dye Gentium Violet from the assaulters. He said he was shocked by the incident as he has taken a supportive stance on the ongoing Dhangar agitation. “I had arranged the meeting of community leaders with the Chief Minister Prithviraj Chavan and the Speaker Dilip Walse-Patil. If this happens to me, I don’t know how to continue working in public life,” he said. P K Grant, managing trustee of Ruby Hall Clinic where Patil was treated and was put under observation described the substance which was thrown at him as “very corrosive”. “Luckily he put his hand on the face so it went only in one eye. The substance resulted into severe irritation and has also caused minor cornia opacity. But his vision is likely to be normalise within 48 hours,” said Grant.